Let’s talk for a minute about dieting willpower. I know, the title doesn’t seem to introduce a post about diets, and the recipe certainly isn’t intended for someone on one, but hear me out, there is a point here. There are different kinds of willpower people have when dieting and losing weight. There’s the minor form of willpower. That’s the kind that is generally found in skinny people who want to lose a pound or five. They can’t figure out why they can’t stay motivated to lose weight. I can. They don’t need to badly enough. The second kind of willpower is the kind you find in someone with a significant amount of weight to lose. These people know how much depends on their weight loss, and they (in theory) have an easier time motivating themselves. Then there is the third kind of dieting willpower. This kind is usually characterized by a desperate urge to lose a specific amount of weight by a specific date. Say, for example, your sister is getting married in two weeks and you need to lose five pounds in order to properly fit into your dress. You have a clear defined goal, as well as an end date, so it should be easier. Or say, purely hypothetically that you have a certain number of pounds you need to lose in order to buy yourself that new SLR camera, and you really want that camera by Hanukah time. That’s the kind of willpower you need in order to bake these cookies and not eat them. I told you I was going somewhere with this. 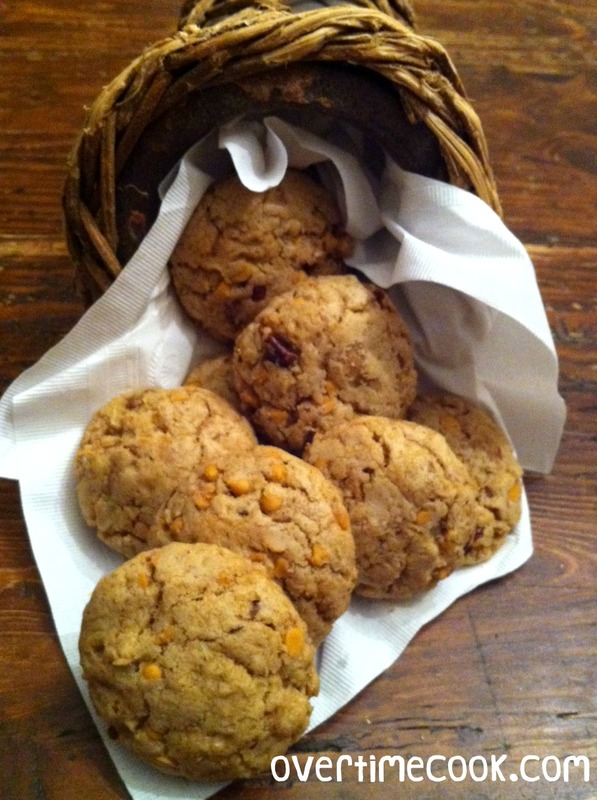 Sure, I bake loads of cookies and don’t taste any of them, but these are special. The smell kind of grabs hold of you and doesn’t let you go until you take a bite. Or ten. Or in my case, I am proud to say, none. If you make these cookies and don’t want to eat one, well, all I can say is…I warned you! In a large mixing bowl or in the bowl of your stand mixer, cream together the butter and sugars until creamy. Add the vanilla extract and eggs, one at a time, stirring well after each addition. Slowly mix in the flour mixture, stirring until just incorporated. Add the toasted rolled oats and stir to combine. Use a wooden spoon to stir the pecans and butterscotch chips in to distribute evenly. Grease two cookie sheets. Using a medium cookie scoop or a Tablespoon measuring spoon, drop dough onto the cookie sheets. If you prefer a smoother look, roll the dough a bit between your palms to form neat balls. Bake cookies at 30 for 11-12 minutes, until just set and golden brown. *If you don’t want to go to the extra step of toasting the pecans and oats, you can skip it. The toasting adds a delicious depth of flavor, but isn’t vital to the cookie. 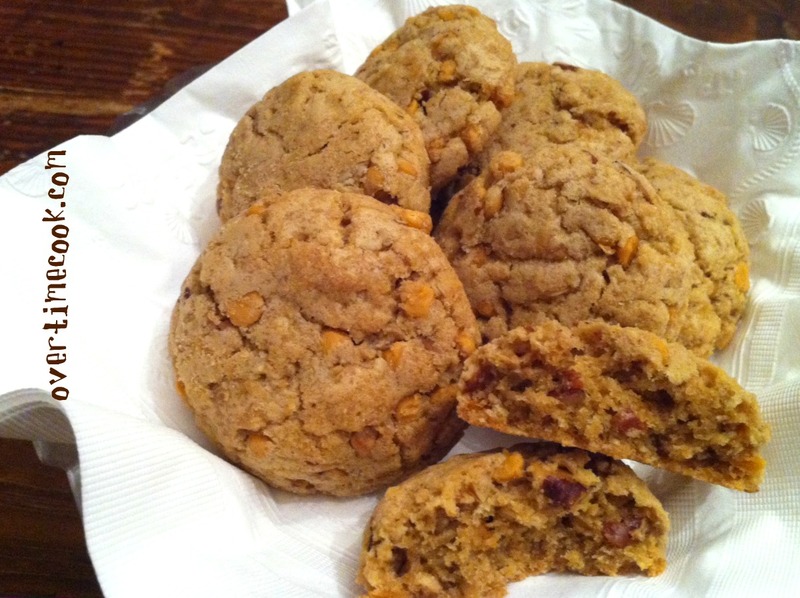 Note: these cookies are sturdier than many, so they are great for packaging and shipping! Anything with the word “butterscotch” always calls my name! These look wonderful! Quite the inventive introduction to your wonderful cookies, I loved it! I have no doubt that you will get that new SLR camera by Hanukah. You go girl! These look purely eeeevil. I want ’em! I want ’em all!! the only way I would be able to do that if is I knew FOR SURE I’d be getting the new SLR! first time here…love your space..
amazing recipe collection with interesting presentation..
i just made these . . it yielded a really large batch of cookies. they came out delicious but th/eir crispy as opposed to soft and chewy. is that how its supposed to be? Yes- as I wrote, they’re a sturdy type of cookie, not a soft and chewy one. i gave the cookies to a few different people and they loved it! Their seriously addictive! Thank you so much for ur amazing original ideas! I already made quite a number of things. I did not heed your warning. I should have listened. Now I’m going to have to ship this batch of cookies to my sister in another state because otherwise I will eat them all myself. HOW CAN A COOKIE BE SO DELICIOUS??!?!!!?!?!!? hey can i use nougat chips instead of butterscotch? i dont have it at the moment..
Old fashioned oatmeal – instant will change the texture quite a bit. Hey, can I make these without butterscotch? You can replace the butterscotch chips with chocolate chip, peanut butter, or the flavor chips of your choice.